This is an age in which, in order to succeed, one must specialise. One conjuror will specialise in thought-reading tricks, another in silent illusion acts, another in sleight-of-hand tricks, another in the presentation of what I may call “large apparatus” tricks. This book will appeal primarily to illusionists, but I fancy that other magicians will find that it is well worth perusal. 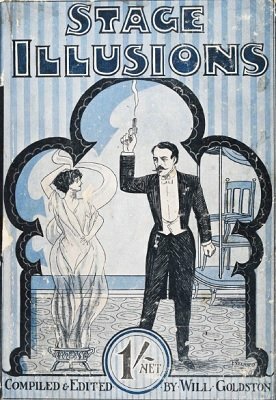 I have heard of illusionists who have produced some of their best effects by merely enlarging small sleight-of-hand tricks, and I have no doubt that some sleight-of-hand performers have been equally successful in devising new tricks by merely watching illusionists at work and “reducing” the illusions to drawing-room size. 1st edition 1912, 112 pages; PDF 80 pages.